There were at least 292 Soldiers from the 32D ‘Red Arrow’ Division who were decorated with the Distinguished Service Cross (DSC) during WWI, at least 66 of those were awarded posthumously. One Soldier earned OLC to DSC during WWI, 1st Sgt. Michael Castura. At least one pair of brothers earned the DSC; Cpl. Floyd W. and Pvt. Lee O. Prescott earned the award for their actions on 4 Aug. ’18 while serving with HQ Co., 120TH FA Regt. The Distinguished Service Cross is our Nation’s second highest decoration for heroism, second only to the Medal of Honor. The DSC was established by Act of Congress 9 July 1918 (amended by act of 25 July 1963). The DSC is awarded to a person who, while serving in any capacity with the Army, distinguished himself or herself by extraordinary heroism not justifying the award of a Medal of Honor; while engaged in an action against an enemy of the United States; while engaged in military operations involving conflict with an opposing or foreign force; or while serving with friendly foreign forces engaged in an armed conflict against an opposing Armed Force in which the United States is not a belligerent party. The act or acts of heroism must have been so notable and have involved risk of life so extraordinary as to set the individual apart from their comrades. The DSC is equivalent to the Navy Cross and the Air Force Cross. Other possible, but unconfirmed, DSC recipients. He is listed as DSC recipient from 126TH Inf. in 32D Div. in WW, but I did not find him listed in 126WwG, nor have I found any other information about him. I suspect he may have been confused with 1st Lt. Edward A. Burton, 128TH Inf., who earned DSC. He is listed as DSC recipient from 126TH Inf. in 32D Div. in WW, but I did not find him listed in 126WwG, nor have I found any other information about him. From Coopersville, MI, he enlisted in Co. F, 32D Mich. Inf., Michigan National Guard, Grand Haven, MI on 21 May ’17. Assigned to Co. L, 126TH Inf., when 32D Div. was organized, he was recommended for DSC by Capt. George L. Olsen for his actions during Aisne-Marne, but I have found no additional information about a DSC for him. He did earn Silver Star Citation for his actions as a litter bearer on 2 Aug. ‘18 near Cierges. He also earned Croix de Guerre w/bronze star for his actions 4 Aug. ’18 near Mont St. Martin, when he and another Soldier rescued a wounded comrade. From Milwaukee, WI, he enlisted in Co. K, 1ST Wis. Inf., Wisconsin National Guard, Milwaukee, WI on 21 Jun. ’16. Assigned to Co. D, 128TH Inf., when 32D Div. 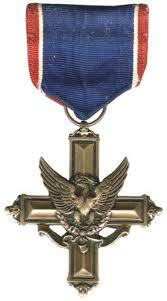 was organized, he earned the Silver Star Citation and the Croix de Guerre for his actions near Cierges ca. 1 Aug. ’18. A newspaper article stated that he earned the DSC, not Silver Star. I haven’t found any other evidence regarding a DSC. He is listed as DSC recipient from 308TH Trench Mort. Btry. in 32D Div. in WW, but I have found no additional information about a DSC for him. According to Indians at Work, May-Jun. ‘43: “In the battle of Juvigny, north of Soissons, Pvt. Elm wiped out a German machinegun nest almost single-handed. He received the Distinguished Service Cross and the Order of the Purple Heart. After three weeks in the hospital, Elm returned to the front in time to take part in the great Allied offensive of Château-Thierry and the Argonne Forests...”. Some references suggest that the DSC was revoked after he and another Soldier were caught by MPs with cases of pilfered prunes, which they were taking back to share with their unit, which had not been fed for several days. He also earned the Purple Heart, after being WIA at Cierges. He also served during WWII, with the 113TH Station Hosp. He is listed as DSC recipient, in addition to the Croix de Guerre, in 126WwG. MWW only lists Croix de Guerre. I’ve found no information about DSC. From Milwaukee, WI, he enlisted in Co. F, 1ST Wis. Inf., Wisconsin National Guard, Milwaukee, WI, on 7 Jun. ‘17 at age 16 (lied about his age). He was assigned to Co. F, 127TH Inf., when the 32D Div. was organized. One day during the Aisne-Marne, a runner was dispatched to carry a message to an adjacent French unit, he never returned. Six others were sent in succession, none returned. Haddock was last available runner, so he went out, successfully bypassed the area where he found all of the previous runners lying dead, delivered his message, and made it back to his unit. The Bn. Cdr. (a Lt.) told him he would recommended him for the DSC, but the Lt. was killed the next day. He is listed as a DSC recipient, HQ Co., 126TH Inf., in Detroit Free Press on 19 May ’19. I have found no additional information about a DSC for him. He did earn the Silver Star Citation, Croix de Guerre, and Purple Heart. He is listed as DSC recipient from 126TH Inf. in 32D Div. in WW, but I did not find him listed in 126WwG, nor have I found any other information about him. I suspect his name was misspelled and he is Sgt. William Luzenski, Co. H, 126TH Inf., who earned DSC. Served with Co. B, 119TH MG Bn. and according to Honor Roll of Menominee Co., Mich. in the World War, he was “decorated with D. S. C. 20 Apr. 1919, for “distinguished bravery on the Meuse-Argonne offensive.”” According to his headstone, he earned the Silver Star Citation. I have found no additional information about a DSC or Silver Star. He did earn a Division Citation, but I have found no information regarding the date or circumstances. Many, but not all, Division Citations later formed the basis of Silver Star Citations. 2d Lt. Joseph P. Seidl, Jr.
From Marshfield, WI, he enlisted in Co. A, 2D Wis. Inf., WNG, at Marshfield, WI. Assigned to Co. A, 127TH Inf., when 32D Div. was organized, he was recommended for DSC, likely for his actions 4-7 Aug. ‘18, when Sgt. Seidl “took command of his company when the officers were all wounded and led an attack.” He was commissioned 2d Lt. on 7 Nov. ‘18. I have found no additional information about a DSC, or any other decoration, for him. He was recommended for DSC for his actions 31 Aug. (18 Aug.) ‘18 while serving with Co. L, 126TH Inf. He and two others captured an enemy machinegun, turned it on the enemy, and captured 47 Germans and several pieces of equipment. He never received the decoration, but both 32D Div. in WW and 126WwG list him as having received it (it doesn’t appear his comrades were decorated either). He did earn Croix de Guerre w/palm for his actions that day, received it in ‘19. He also earned the Purple Heart, after being WIA 5 Oct. (4 Oct.) ‘18. In 1968 a friend set out to learn why he had never received a U.S. decoration. Six years later the Army determined “the recommendation was never entered into official Army records” and awarded him the Silver Star on 15 Apr. ‘74 during a ceremony at Rock Island Arsenal. He is listed as a DSC recipient, 107TH Engr. Regt., in Detroit Free Press on 19 May ’19. I have found no additional information about a DSC for him. He did earn the Légion d'Honneur (French Legion of Honor) and Croix de Guerre. Enlisted in Michigan National Guard and served with Co. K, 126TH Inf. 126WwG lists him as DSC and Croix de Guerre recipient. He did earn the Croix de Guerre w/bronze star for his actions on 1 Jun. ‘18 during a joint French/U.S. night raid near Ammertzwiller, Alsace, but I have found no additional information about a DSC for him. He is listed as DSC recipient from 127TH Inf. in 32D Div. in WW, but I have found no additional information about a DSC for him. He earned Silver Star Citation for his actions as Capt. and med. off. on 31 Aug. ‘18 near Juvigny, also earned Croix de Guerre. He earned the Distinguished Service Medal, Silver Star Citation, and Croix de Guerre with palm. Numerous references state he earned the DSC, but I cannot find any substantial or official information about a DSC. From South Muskegon, MI, he enlisted in Co. G, 32D Mich. Inf., Michigan National Guard, Muskegon, MI, on 22 Jun. ’16. Assigned to Co. L, 126TH Inf., when 32D Div. was organized, he was recommended for DSC by Capt. George L. Olsen for his actions during Aisne-Marne. The Old Command lists him as a DSC recipient, but I have found no additional information about a DSC for him. He did earn Silver Star Citation, posthumously, for his actions as a litter bearer on 2 Aug. ‘18 near Cierges. He also earned Croix de Guerre w/bronze star, posthumously, when he and another Soldier rescued a wounded comrade. Mech. Yaney was KIA 5 Oct. ’18.